In October 1912 Ehrenfest arrived in Leiden, and on 4 December he gave his inaugural lecture Zur Krise der Lichtaether-Hypothese (About the crisis of the light-ether hypothesis). He remained in Leiden for the rest of his career. In order to stimulate interaction and exchange among physics students he organized a discussion group and a study association called De Leidsche Flesch. He maintained close contact with prominent physicists within the country and abroad, and invited them to visit to Leiden and give a presentation in his lecture series. Ehrenfest was an outstanding debater, quick to point out weaknesses and summarize the essentials. He was not merely the best teacher in our profession whom I have ever known; he was also passionately preoccupied with the development and destiny of men, especially his students. To understand others, to gain their friendship and trust, to aid anyone embroiled in outer or inner struggles, to encourage youthful talent—all this was his real element, almost more than his immersion in scientific problems. ^ Jaeger, Gregg (1 May 1998). "The Ehrenfest Classification of Phase Transitions: Introduction and Evolution". Archive for History of Exact Sciences. 53 (1): 51–81. doi:10.1007/s004070050021. ^ Paul Ehrenfest (1904). "Die Bewegung starrer Körper in Flüssigkeiten und die Mechanik von Hertz" (PDF). Vienna. ^ Kumar, Manjit (2009). "Einstein Forgets Relativity". 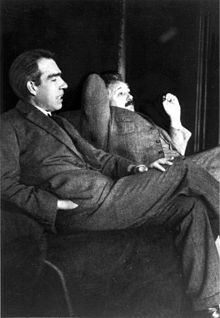 Quantum: Einstein, Bohr, and the Great Debate about the Nature of Reality. Icon Books. p. 296. ISBN 978-1-84831-035-3. Retrieved 5 February 2010. ^ Ronald Clark (2011). Einstein: The Life and Times. Bloomsbury Publishing. ISBN 9781448202706. That Einstein's attitude was the result more of muddle than agnostic scruple seems clear from a letter which he wrote less than two years later when Paul Ehrenfest ruled himself out from becoming Einstein's successor by roundly declaring himself an atheist. ^ Thomas Levenson (2004). Einstein in Berlin. Random House of Canada. p. 172. ISBN 9780553378443. The man he had hoped would succeed him in Prague, Paul Ehrenfest, refused to compromise his true atheist's principles. Einstein scolded him. "Your refusal to acknowledge a religious affiliation" was just this side of "willful stupidity", he assured him, with the benefit of recent experience. Once he became a professor Ehrenfest could revert to unbelief. ^ "Colloquium Ehrenfestii". Lorentz.leidenuniv.nl. Retrieved 2014-01-06. ^ "Institute for Theoretical Physics". Lorentz.leidenuniv.nl. Retrieved 2014-01-06. ^ a b Boeyink, Rowdy. "Ehrenfest and the New Physics in the Interbellum Work and life of Paul Ehrenfest between 1916 and 1925". ^ Van Lunteren, F. H.; Hollestelle, M. J. (2013). "Paul Ehrenfest and the Dilemmas of Modernity". Isis. 104 (3): 504–36. doi:10.1086/673271. PMID 24341262. ^ "Paul Ehrenfest (1880 - 1933)". Royal Netherlands Academy of Arts and Sciences. Retrieved 27 July 2015. ^ Farmelo, Graham (2009). The Strangest Man: The Hidden Life of Paul Dirac, Quantum Genius. Faber and Faber. p. 232. ISBN 978-0-571-22278-0. ^ Trogemann, Georg; Nitussov, Alexander Y.; Ernst, Wolfgang (2001). "Paul Ehrenfest". Computing in Russia: the history of computer devices and information technology revealed. Vieweg+Teubner Verlag. p. 60. ISBN 978-3-528-05757-2. Retrieved 15 June 2009. ^ "Lorentz Institute – Colloquium Ehrenfestii". Leiden University. ^ "Paul Ehrenfest best paper award for quantum foundations". Vienna: Institute for Quantum Optics and Quantum Information. Dieter Hoffmann, Hubert Laitko, and Staffan Müller-Wille, Paul Ehrenfest[permanent dead link] in: Das Lexikon bedeutender Naturwissenschaftler (in German). Bolles, Edmund Blair (April 2004). Einstein Defiant: Genius versus Genius in the Quantum Revolution. National Academy Press. ISBN 978-0-309-08998-2.